High Roller casino: discover a large portfolio of casino games and make your own way through this unique virtual metrocity! In 2017, a new casino unlike any other was born: HighRoller. It is a totally unique operator, since it transforms the gaming experience of its players into an extraordinary adventure through the fabulous High Roller metrocity. Discover this one of a kind city which, once night has fallen, lights up in the neon colours which bring to mind the world of casino. When you open an account on the online casino High Roller, you create an avatar which you can personalize to suit your desires. Your next objective will be to progress on the High Roller Metrocity map. 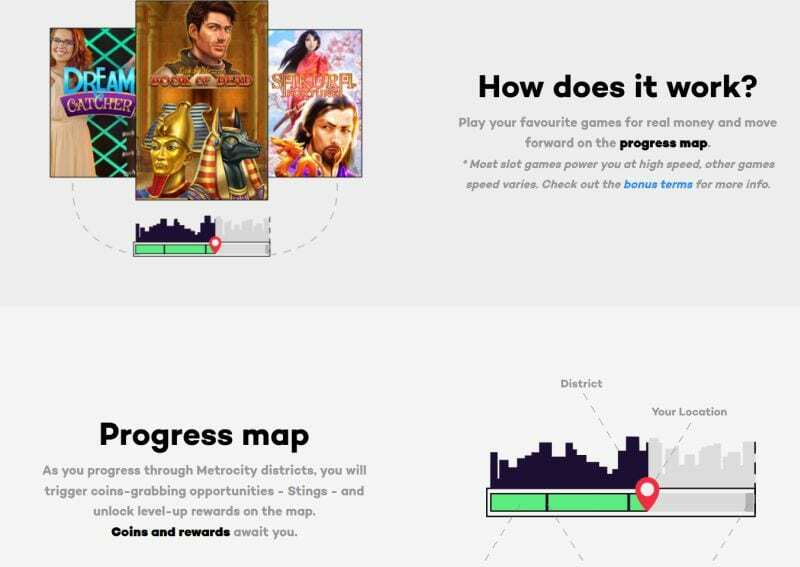 The more you play, the more ground you will cover across the different districts of the city and the more rewards you will collect. Be careful, for the players whose accounts are inactive for several days may become a sought-after target for the other players of the online casino, all of whom will have only one thing in mind: looting their rewards. As soon as you register on the website, you will receive coins, the virtual currency circulating in this incredible metrocity. Then, every bet you place on the High Roller slot machines and other casino games will allow you to progress on the city map and to win coins and rewards. This is certainly one of the most original loyalty programs of the iGaming industry! On top of the very elaborate design which brings the High Roller metrocity to life, we appreciate the lobby of this casino. Its game portfolio is presented in a very clear and appealing manner. On High Roller, one can find slot machines, jackpot slots, some live casino and table games. Our High Roller review looks at this extraordinary operator which belongs to GiG. Guts and Rizk are some of its sister casinos. The casino offers an original first deposit bonus. First of all, for every first deposit of a minimum of £20, you receive £1 wager free on Dream Catcher, a live fortune wheel casino game! The operator will also grant you 50 High Roller Free Spins and 20 Coins to be used in the casino’s shop. Before making your first deposit on the website, you can choose to either accept this High Roller welcome offer or to play without making use of this offer, in this case, simply click on “No Bonus, thanks”. The minimum necessary High Roller deposit in order to benefit from this welcome bonus is of £20. It is possible for one to make the most of this welcome offer up to 30 days after having opened an account. Deposits carried out via Neteller or Skrill (Moneybookers) are not eligible. 1st day: Turn It Up! 5th day: Book of Dead. The winnings obtained thanks to the Free Spins are subject to a 35X wagering. Bets placed with the bonus cannot exceed £5. The same applies to all bets as long as the wagering requirement has not been completed. All the games do not contribute in the same way towards the wagering requirement. Please note that when you play with a High Roller bonus your bets will first be placed using your real balance, in other words with the funds you have deposited. It is only once your own funds reach 0 that your bonus balance is used. The minimum deposit is set at £10. This is therefore the sum you must credit your real money balance with if you wish to start playing on this website, however if you wish to benefit from the welcome offer, you must deposit at least £20. You may withdraw your winnings as soon as your real money balance is higher than £10 since it is the minimum withdrawal amount. There exists no maximum limit on the amount you may withdraw on a monthly basis, however there may be some limits depending on the chosen payment method. For example, you may not withdraw more than £5,000 at one go by bank card, on the other hand you may carry out withdrawals several times a day. HOW TO GET YOUR WINNINGS ? Withdrawing your winnings is very easy. Simply go to your personal space, click on your balance and then on the Withdrawal tab. The amount available on your account will be displayed at the top of the window, all you now need to do is choose a payment method (by default, it is that which was used to credit your player account, unless this is not feasible) and enter the amount you wish to withdraw. We would like to remind you that if you carry out your first deposit with a Neteller or Skrill account, you will not benefit from the welcome offer. High Roller Casino does not apply any processing fees, whether it is on deposits or on withdrawals. The verification of these documents by the services of the operator is generally carried out rapidly, in just a few hours. The delay may occasionally be a little longer on busy days. They must verify their account within a maximum timeframe of 72 hours following their first deposit. If this is not done on time, the player will have their account frozen until they provide the operator with proof that they really are above the age of 18. If there has been no activity on their account for over 30 days in a row and that they have no funds, the casino may close their account. If they however still have funds on said account, they will be contacted by the casino in order for them to be recredited. Once your withdrawal request has been registered, it usually only takes a few hours for the mobile casino HighRoller to process the latter. When there is a high number of request, the maximum one must wait is 24 hours. Thereafter, the timing of the receipt of funds does not depend on the operator but on the chosen payment method. It can take up to 3 business days by bank transfer, Visa or Mastercard, whilst other payment methods are instant. The High Roller Portfolio contains over 750 casino games: slot machines, but also live casino games and table games. 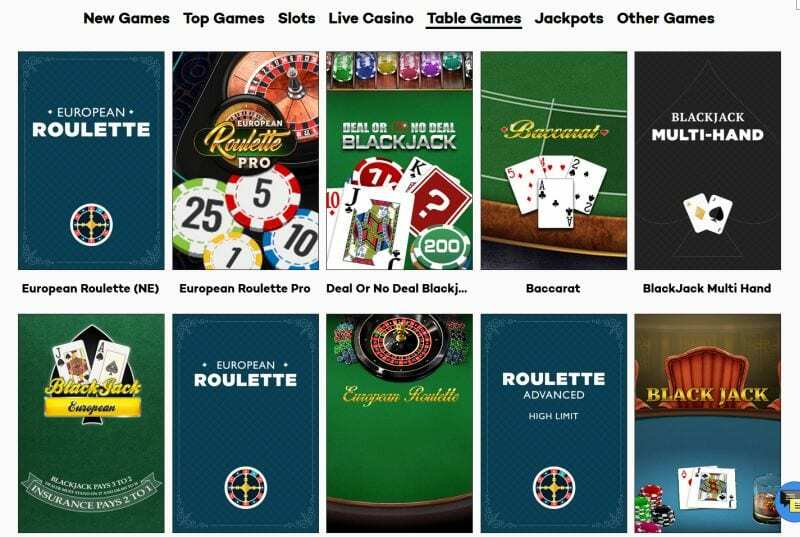 These High Roller slots were developed by some of the leading slot providers of the iGaming industry: NetEnt, Microgaming, IGT, Quickspin, Yggdrasil, Evolution, Blueprint, Big Time Gaming, Betsoft, Spigo, Genii, NextGen, Elk Studios, Thunderkick, Rabcat, Scientific, Red Tiger, Push, Pragmatic Play, Play’n Go. Players can thus choose from a beautiful selection of themes, volatility and RTP (Return to Player). Book of Dead, Gonzo’s Quest, Bonanza, Flowers… Here are some of the video slots you will find in this extensive portfolio. The High Roller players will also find an appealing choice of jackpot slots such as the famous Mega Moolah by Microgaming and Mega Fortune by Netent for example. Regarding the live casino games (live Roulette, Blackjack, Texas Hold’em, Football, Baccarat, Poker), they are essentially games provided for by Evolution Gaming, the leader in the field of online live casino. One may also come across a few Netent live games. 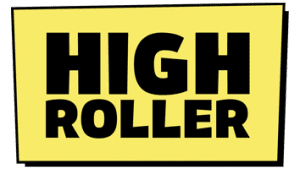 High Roller is a GIG casino, GIG being the B2C branch of the group MT SecureTrade Limited. It was launched in 2017 by Betit Operations Limited, a company created in 2013 and based in Malta, which was already at the head of 3 online casinos: Thrills (released in 2013), SuperLenny (2014) and Kaboo (2015). In June 2016, Betit was aquired by GIG (Gaming Innovation Group) for 54 million euros. Founded in 2008 by Robin Reed and Frode Fagerli, the GIG group is very well known in the iGaming industry. It has been listed on the Oslo stock exchange since June 2015 and already had over 600 employees in 2017. It notably owns some of the most popular online casinos like Dunder, Rizk, Ikibu or even BetSpin. This casino possesses an MGA license, the Maltese regulator (licence MGA/CRP/257/2014 issued on the 01/08/2018). Likewise, it is authorized to offer its games to British players thanks to a UK license issued by the Gambling Commission (license 039482 issued on 01/11/2014). Safety is an overriding consideration on High Roller casino. As required by the authorities, both the players’ and the company’s funds are kept on different bank accounts in order to ensure the transparency and security of transactions. In an effort to combat money laundering and fraud, the verification of players’ identity is obligatory with this online operator. The casino has chosen to classify its slot machines in an unconventional way, and according to us this is a very good thing. 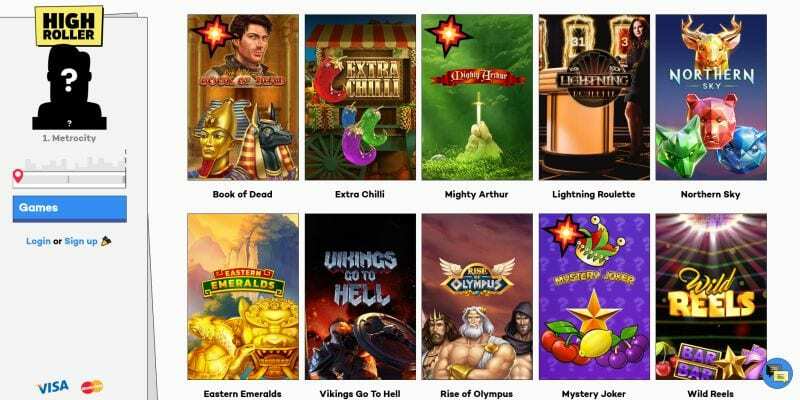 It only takes a simple click to find the High Roller online slots with a high volatility, those that are new (“News on the Streets”) the grand classics (“District Legends”) or even those games which offer special features (“BigTime Bonus Features” and “Wild and Free Spins”). When you open a game, a new window appears. This singular technique is very practical for the player who can go to their personal space or simply surf on the website while keeping their game open, they do not need to exit the game. You will see, it is very convenient! We love the design of this casino which creates a totally unique image for it. It uses drawings which seem straight out of a comic book without making it look childish. We are clearly in the theme of adult comic books. The operator has as a matter of fact created an entirely new universe. By logging in, the player naturally has access to casino games, but they also slip into the skin of his character who must roam through a dark metrocity where each corner is full of thrills. The live chat service is not always active, sometimes you are required to write down your question only to receive the response by email, within a dozen of minutes based on our experience. WHAT WE WOULD LOVE TO GET ON HIGH ROLLER CASINO ? With such a name, one might have thought that this casino would give particular attention to high rollers, or in other words to players who play large sums of money. We are therefore disappointed that it does not offer a VIP program for bigger players. The loyalty of gamblers is certainly rewarded every day thanks to the coins they may receive, however we do find it unfortunate that there exists no special program reserved to the High Roller VIP players, which would entitle them to preferential treatment (special promotions, faster payments, a personal account manager…) To conclude our High Roller review, in the future we would like the operator to surprise us with an innovative High Roller VIP program. On another note, the operator is indeed a mobile casino, since its platform may be used on desktop, smartphone as well as on tablet, however it has yet to develop a High Roller App. These days, iOS and Android apps have features that all the best online casinos must offer their clients.